The Lorraine 40t is a French tier 8 medium tank, currently removed from the game. It uses a 6 round drum autoloader. The Lorraine 40t led to the Bat.-Châtillon 25 t. In patch 0.9.15.1 it was replaced the Lorraine 40t by the Bat.-Châtillon 25 t AP. Compared to the other tier 9 mediums the Lorraine 40 t features the lowest armor values while being even bigger than the Panther II. However, the ability to equip the devastating 100mm SA47 more than compensates for its unfortunate shape by being able to penetrate most Tier 8/9 Tanks. Bear in mind however that reloading the 100mm SA47 magazine takes time, so its best to plan ahead and look for cover or a quick way out of enemy crossfire as even Low-Tier-Tanks can easily penetrate its armor. With the new changes in patch 7.5, the research for the Lorraine has changed considerably. Instead of having 3 engine upgrades, they have been condensed into one. What this means to the player is that the Lorraine has been given some considerable upgrades to the stock tank; instead of feeling sluggish, and unwieldy, it feels more like you're driving a less nimble and faster Type 59. Overall, the Lorraine 40 t is a destructive but vulnerable Hit & Run tank and excels in delivering fatal blows to preferably distracted enemies. As a tier 9 tank, its stock gun is woefully inadequate, 170mm of penetration just doesn't cut it in tier 10 matches. The type of opponents you'll be facing will generally make you gnash your teeth in frustration unless you're able to flank them. Which, in higher tier games isn't always the brightest idea; as exposing yourself leaves you open to fire. High tier TDs and heavy tanks kill you with 2-3 shots. Higher tier artillery is the bane of the Lorraine, it should come as no surprise that any Soviet or German artillery sporting 203 mm or 210 mm guns, or especially the T92 is capable of one-shotting the Lorraine, even without hitting the ammo-rack. Consider 6th Sense perk obligatory and always move to cover if you get spotted. Avoid brawling with other medium tanks. Your turret rotator is easily damaged which results jamming your turret and hits on your side under turret damage your ammorack. Missing or bouncing a shot could mean you run out of ammo while fighting the enemy and you get quickly killed. Don't try to scout in any circumstances like you did with AMX 13 90. Use equipment to minimize your aiming time. Just remember, support your team at the start of the battle and don't go solo, otherwise you'll end up in an early grave. You can easily finish off wounded enemy tanks in endgame if you have hitpoints left. The radios carry over from the 13 90. If you don't already have it from the AMX 50 100, unlock the 100mm SA47 gun first as it gives you much-needed penetration and damage. Research the tracks next as the stock suspension can only hold a single piece of equipment at most with the top gun. Unlock the Maybach HL 234 P50 engine for increased speed and lower fire chance. The success of German and Soviet heavy tanks, like Tiger II and IS-2 (and also IS-3) excited French tank engineers and would literally not let them stay put. They were inspired, as was expected, by German and Soviet heavy tanks. The French engineers had developed several new tank models. Of course, they were neither the biggest, nor the heaviest examples, but ended up being quite spectacular armored vehicles nevertheless. 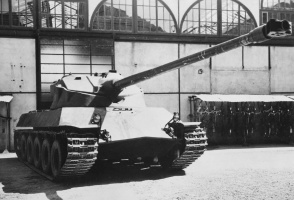 It is likely that not only the glorious armor, but also firepower of the aforementioned steel monsters, being produced in Germany and USSR, became the source of the fixed idea of installing 100-mm (for starters) and then even 120-mm caliber guns. 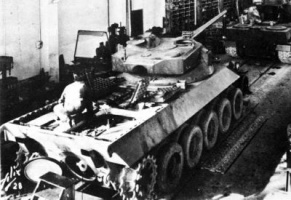 However, almost all of the produced tank projects would either, for one reason or another, had stayed in production for an indefinite amount of time or be made in limited quantities. As far as is known, almost all experimental machines used the German engine Maybach as a power source. As sad as it might be, the largest part of the French tank forces in that period was issued with “Sherman”, M-26, M-24 and also “Panther” tanks. 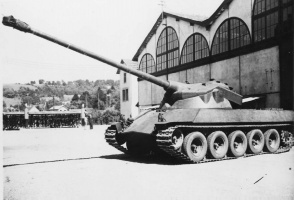 Lorraine 40t had never left the testing phase, only two prototypes would be produced. Actually, this combat vehicle was a lighter version of the AMH-50 heavy tank, but some interesting construction solutions would distinct it from the others. Unlike it’s post-war predecessors (in this branch), the tower of this tank was installed inside of the front part of the body. Also, the tank had another characteristic – “pike nose”, like IS-3. It’s worth mentioning the rubber tires on the wheels of the running gear for added amortization. 1952 Lorraine 40t at chars-francais.net Photos, specs, and brief history in French.